Retail store owners must adapt existing technologies to improve customer satisfaction. Interactive kiosks offer ease of use to customers in browsing and purchasing store items. Kiosks with 22-inch projected capacitive touchscreen PC provides clarity and crisp images, improving the overall customer experience. Self-service kiosks have taken the consumer experience to the next level. It provides users with a simplified and easy way of purchasing in-store goods [Kiosk Marketplace]. As for retail owners, it also helps them provide better customer service. However, these interactive kiosks can only be as useful if it bears the most compatible computing system. This is to ensure that kiosk applications can be installed. At the same time, users may have to utilise this device even for frequent usage. So, as a kiosk manufacturer, it is essential to building a kiosk with the best computing solutions. Fortunately, our S22 rugged industrial panel PCs with projected capacitance have the requirements needed for a kiosk. This device comes with a high bright LCD screen with a 1280 x 1080 resolution which displays high clarity and crisp images. What’s more, it has a bright adjustable display ensures that these images can be best viewed even in poor lighting environments. Apart from high definition screen displays, this device also bears a wide variety of features that can be utilised in kiosks. So, in the following sections, learn why choosing the 22-inch panel PC for kiosks is a great option. 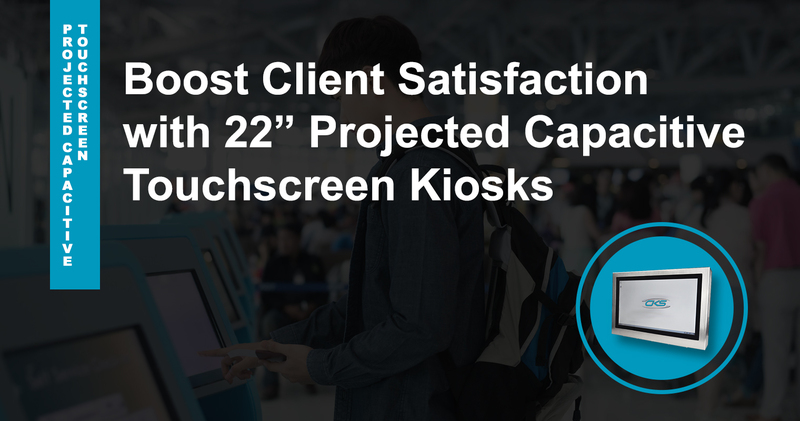 A study shows that advanced interactive kiosks built with better touchscreen functionalities are shown to improve the overall customer experience [MVP Works]. This means that in-store retail kiosks must be built with an interface which quickly detects and correctly responds to input. However, our 22” industrial PC features a projected capacitive touchscreen technology. It has an etched conductive layer which can detect user input despite the presence of a tempered glass interface. So, it extends the device’s screen lifespan to approximately 200 million instances. Also, its multi-touch capabilities also enable the users to pan, rotate or zoom-in an image on the screen. Therefore, it can showcase products in full detail for the consumers to review. So, does our 22-inch touch screen computer have other capabilities needed for retail kiosks? Find more features of our industrial-grade PC which makes it suitable for retail kiosk applications. Customers often use in-store interactive kiosks to browse choice selections, items for sale, and store promotions. However, their time is often limited, and thus, they want their preferred information provided as soon as possible. Therefore, store kiosks should have features which can quickly display the data needed by the client while performing optimally despite extensive use. Now, our S22 ruggedised computer, with projected capacitance technology, have the features needed for retail kiosks. Here are a few specifications of our device which is ideal for this application. Our device has an Intel® Core™ i7-3610QM Processor, which also features an Intel® Hyper-Threading Technology. It can quickly analyse large volumes of store product-related data with precision. Therefore, customers can efficiently browse in-store offerings and potentially purchase an item of interest. Advanced kiosks often have high internal temperatures due to extensive use and extended operating times. However, our S17 industrial PCs has an external waterproof fan, which operates despite the presence of moisture. Apart for its waterproof feature, this fan allows the device to function in temperatures above 50oC for extended periods of time without performance loss. So, operators can expect that this device can function at its peak capacity in most environments. Our 22-inch industrial computer has a high-quality 5H hardness rating tempered glass with 91% transparency. This allows the device interface to maintain its smooth interface and output clear images despite frequent handling. In a retail store, enhancing client satisfaction is paramount in excellent customer service. By integrating a reliable computing technology to kiosks, it can help consumers in providing a secure method of browsing and ordering in-store products. So, build an interactive kiosk using our 22” projected capacitive touchscreen PC. Its interface, combined with a high-resolution screen, provides the ideal platform for promoting in-store products. Give customers the highest quality of service. Contact our industrial computer manufacturers today.